When Martine and I have finished taking the Durango & Silverton Narrow Gauge Railroad connecting Durango with Silverton, we will head down to Gallup, NM, perhaps stopping for a few hours at Window Rock, AZ, the capital of the Navajo Nation.The road connecting Farmington, NM with Gallup used to be called U.S. 666, aka “The Devil’s Highway.” A few years back, the highway changed its number to the less apocalyptic U.S. 491. Even 491 has a curious Biblical resonance. When Peter asked Jesus how many times shall he forgive his brother who sins against him. According to Matthew 18:22, Jesus answered him, “ I say not unto thee, Until seven times: but, Until seventy times seven.” Let’s see, that multiplies out to 490. In the 1960s, Vilgot Sjoman came out with a Swedish film entitled 491, presumably referring to the end of someone’s patience at being excessively sinned against. 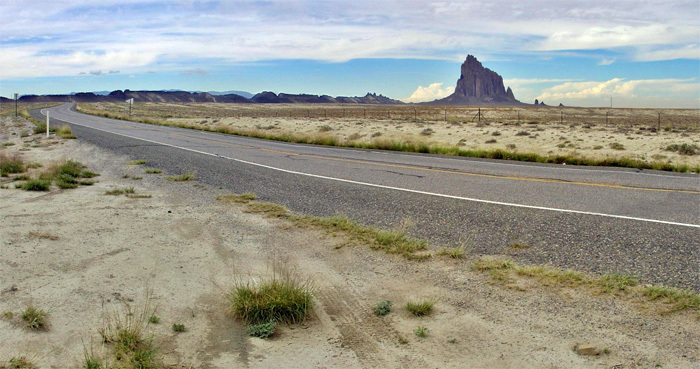 When we take Highway 491 née 666, we will pass Ship Rock, sacred to the Navajos (see above photo). I’ve always wanted to take this route from Farmington to Gallup, but I usually traveled in the past via the Chaco Culture National Historical Park, which is my favorite destination in New Mexico. However, like many of the best places in New Mexico, I would not venture to take a rental car down the washboarded access road. That also goes for the Bisti Badlands and the De-Na-Zin Wilderness, all in the same general area. Had I but world enough and time, however, …. This entry was posted in travel and tagged chaco-canyon, farmington, gallup, highway-666, new-mexico. Bookmark the permalink. Are you going to visit any of the historic trading posts on the rez? My old neck of the woods, Jim! 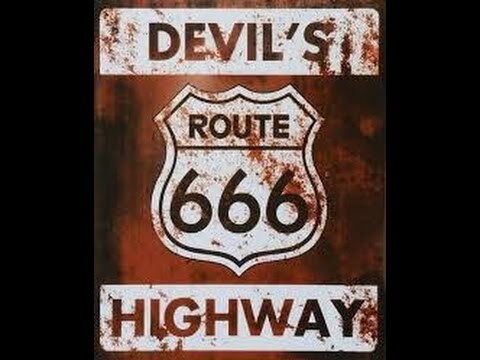 When I lived south of Holbrook, Arizona had changed the name of 666, but New Mexico hadn’t yet. That always gave me a chuckle. Have traveled on it many times. Every time I passed through Window Rock, I was looking for buildings mentioned in Hillerman’s books. Tom – We may just swing over to Window Rock, but then we return to New Mexico. We’ve already been to the Hubbell Trading Post and several others. Dagny – One of the real highlights of being anywhere near Window Rock is listening to KTNN Radio, whose offices Martine and I visited when Selena Manychildren was broadcasting.